Do you want your audit reports to be read, acted on and appreciated by your audit clients? 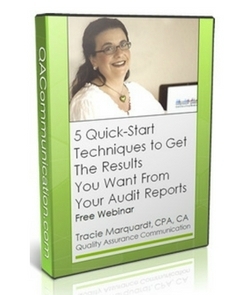 Then take the first step by getting a free 1-hour training on the 5 Quick-Start Techniques to Get the Results You Want From Your Audit Reports. Strategies to lessen your audit client’s pain when dealing with negative opinions and unavoidable change. Get instant and lifetime access to this 1-hour webinar right now by filling in the form below!